Monarch Air Group provides private air charter in Santa Fe, NM. Our clients benefit from top-notch service, unrelenting dedication to safety, wide selection of aircraft, and years of experience in chartering private jets. To obtain a free quote, please use our online quoting tool provided below, or call toll free 1-877-281-3051. Nestled in the foothills of the Rocky Mountains at 7,000 feet, Santa Fe is New Mexico’ capital city. 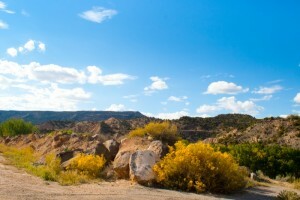 Santa Fe is a famous travel destination with natural beauty and an average of 325 days of sunshine and blue sky. The city is rich in Spanish and Mexican history, heritage, arts and culture. Voted as one of the most popular travel destinations of America and one of the top three art cities of America, Santa Fe is often referred to as “The City Different”. There are fascinating streets lined with genuine New Mexico treasures, adobes, astounding museums and fine art galleries. Santa Fe is home to the Center for Contemporary Arts, the Georgia O’Keeffe Museum, the New Mexico History Museum, the Palace of the Governors, and the Santa Fe Opera. Each year Santa Fe hosts many cultural festivals and events including Fiesta de Santa Fe, the Contemporary Hispanic Market, the Santa Fe Indian Market, Rodeo de Santa Fe, and the Santa Fe International Folk Art Market.